Sanderson's Wooden Bowls is a husband and wife team, Sam and Weeza Sanderson, who handcraft each of their wooden bowls in their East Burke, Vermont studio using local woods and natural, food-safe finishes. Each bowl is unique and takes a year to reach completion. The charm of our farm would be nothing without the adorable animals that make up our farm. Click here to learn more about our Miniature Donkeys and Nigerian Dwarf Goats that are waiting here to meet you and your family! 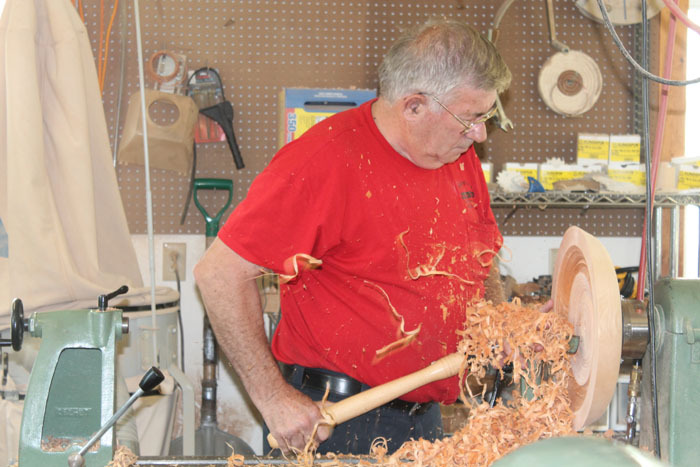 At Sanderson's Vermont Wooden Bowls, the process of making one of our wood bowls takes over a year from start to finish. It begins by choosing the right piece of wood - we use only Northeast Kingdom Vermont sourced woods for all the bowls in our workshop, but we are happy to use a custom piece of wood if a client has some wood they would like us to work with. Once we choose the right log for our project, be it a wood bowl, dish, platter, or art piece, we turn the green wood until it is approximately the right size. We leave a 10% thickness on this rough-turned bowl, and coat it generously with wax. The bowl is then stored for a full year so it can dry completely, slowly and naturally. The slow-drying will slightly warp and twist the bowl, but it is slow enough that the bowl rarely cracks or splits. At the end of the year, the extra thickness that we left on the bowl before drying allows us enough material to re-turn the bowl to its final shape and finish it. Come visit our farm and workshop in East Burke to see Sam turning bowls. View our wide selection of wooden bowls, platters, pens, bottlestoppers, salad bowl sets, and more. Afterwards, enjoy an on-site farm tour, where you can visit our miniature donkeys and Nigerian Dwarf goats. They are very affectionate and love attention. Our showroom hosts a variety of bowls, platters, dishes and other items turned out of wood. Visitors are impressed by the variety of bowls, their shapes, sizes, and especially their quality. We use only food safe oils on our wooden bowls, so these bowls are both beautiful and functional. Visitors to the studio also enjoy the unusual bowls with special shapes, some made from burls, and some turned from tapped Sugar Maple trees with the tap holes from years ago still showing in the finished bowl. Some of our pens, bottle stoppers, fan pulls, and key rings are turned from deer or moose antler or from unusual pieces of wood with gorgeous unique grains. Do you have a piece of wood with sentimental value that you'd like to turn into a treasured gift? There's nothing as special as a hand crafted custom wood gift made from your own wood. At Sanderson's Wooden Bowls, we can transform your wood into a custom wooden bowl, wooden pen, vase, bottle stopper, and more. Larger pieces of wood are ideal for bowls, but even small pieces of wood can be turned into a pen, thin vase, or wine bottle stopper. Please contact us to see how we can turn your piece of wood into a hand crafted custom gift of heirloom quality. Email us at info@vtbowls.com!